'Tis the season to be jolly and you can't get any more jolly than a silly elf. 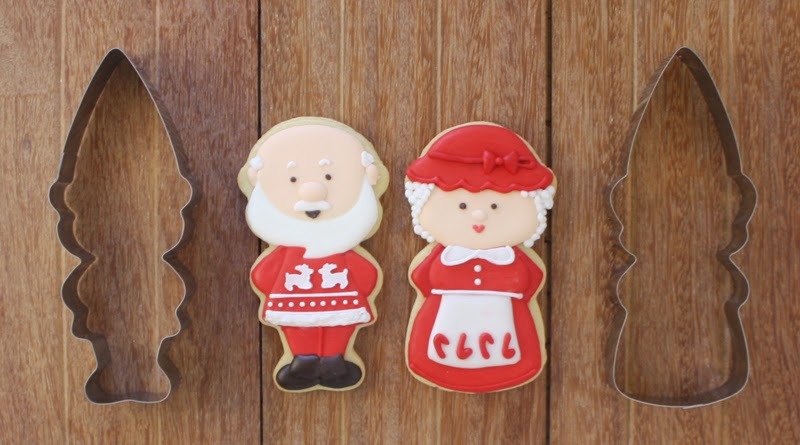 My gnome cookie cutters are all dressed up for the Holidays with brand new stencils designed just for them. Get the complete set in my Etsy store at a special price for Christmas! 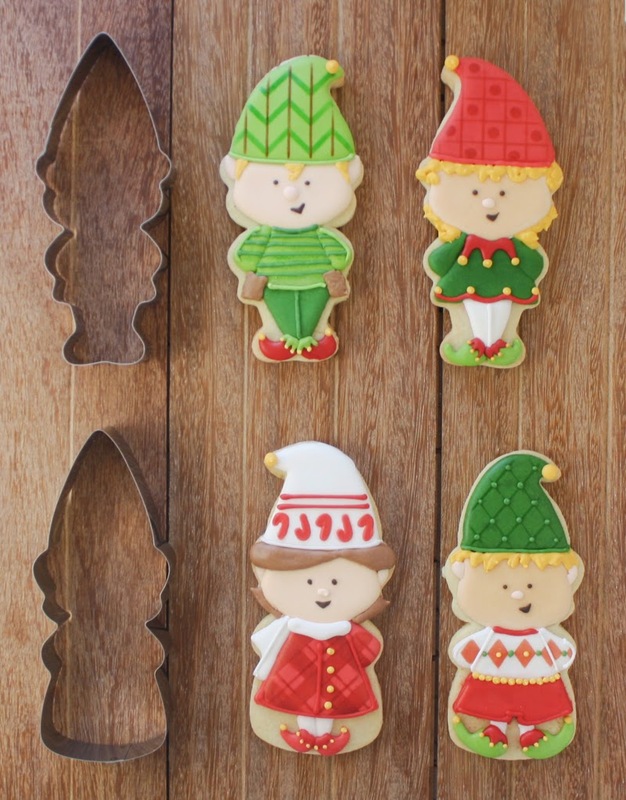 You can use the gnome cookie cutters to make elves by gently curling the hat to the side before baking the cookies. You'll get a lot more designs out of the cutters if you don't think of one just as the "boy" or "girl". The "boy" cutter doubles as a girl with a short dress. The "girl" also works for boys in long pants and coats. 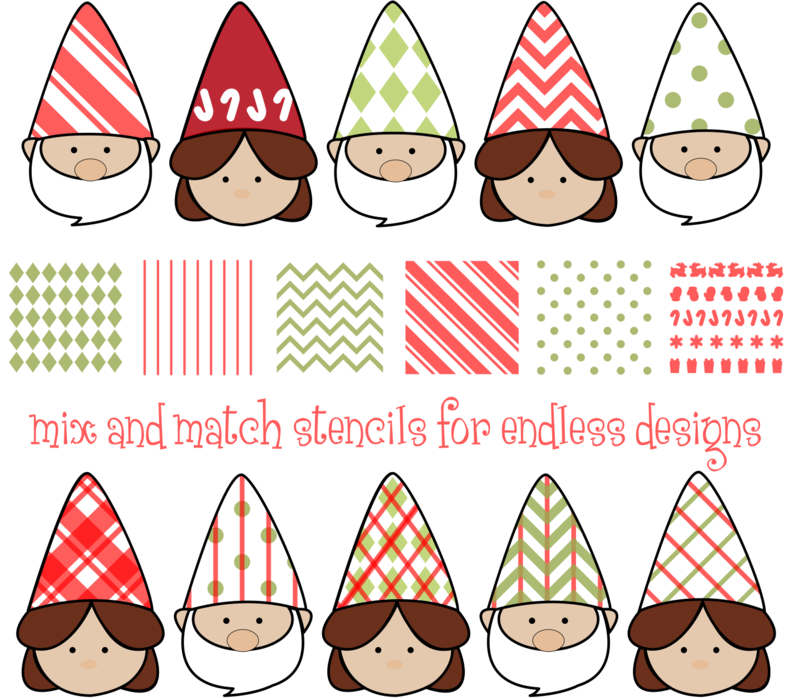 Trim the hat off the gnomes to make Santa and Mrs. Claus. You can visit my party hat post for a full tutorial on cutting characters with different hats from these cutters. 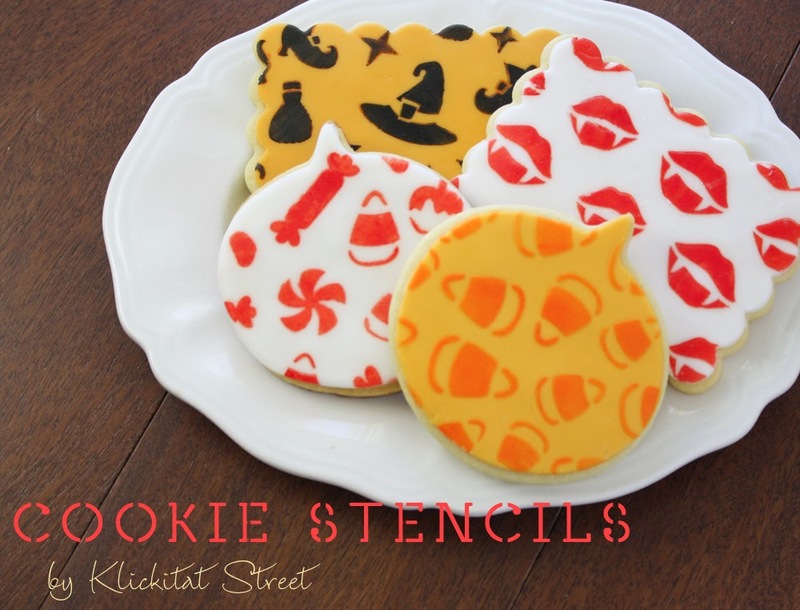 Use the stencils with food color or royal icing to dress up your cookies. 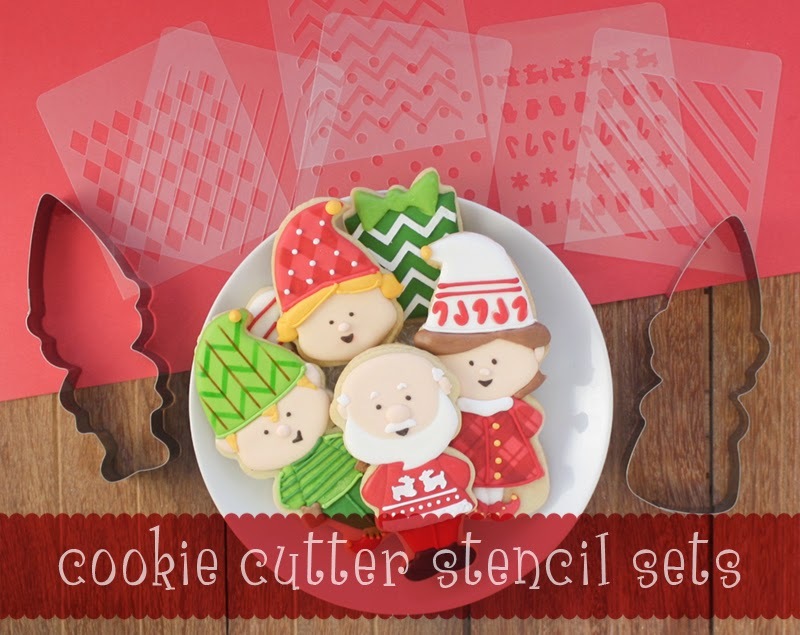 The cutter sets include 6 stencil designs scaled down to be just the right size for elf clothes. 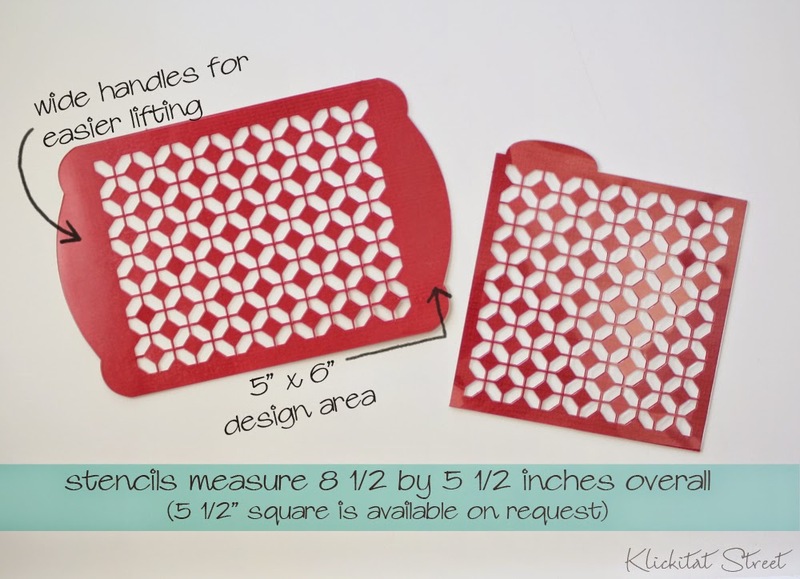 Each mini stencil measures 3.5" x 4" with a pattern area approx. 3" square. 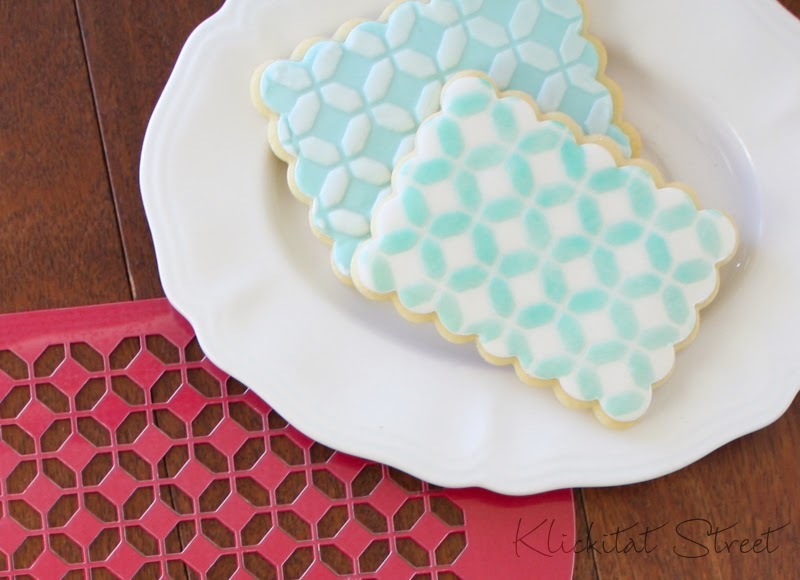 Turn the stencils this way and that and layer color and icing for even more different looks! I hope to add a few more stencil cutter sets to my shop this week so keep an eye out! 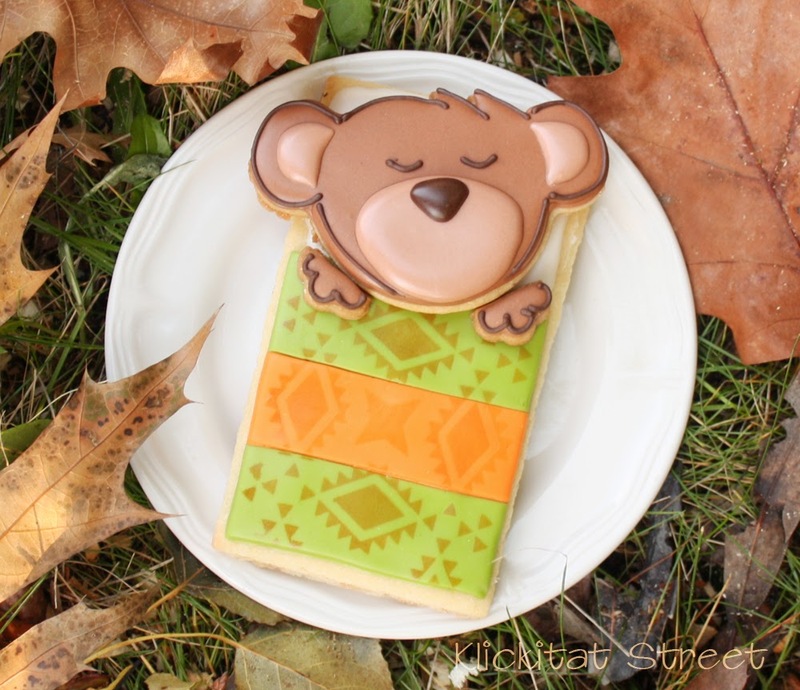 I can't imagine anyone reading my blog doesn't know of the fantastic cookie artist Lisa Snyder from The Bearfoot Baker. If somehow you've arrived here from a strange alternate dimension you must go now and check out all her amazing work! I've been a huge fan of Lisa's since I started my own cookie journey. I love all the cute and silly critters she turn into cookies on a regular basis. 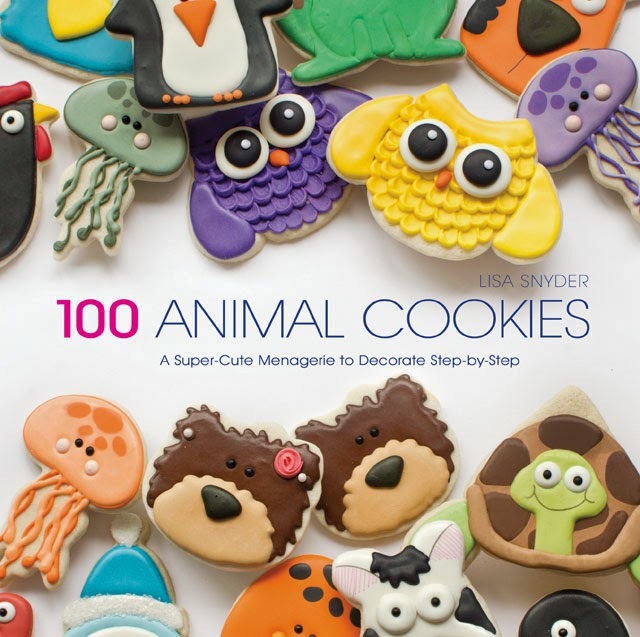 Lisa recently had her very own book published, 100 Animal Cookies: A Super Cute Menagerie to Decorate Step-by-Step, and it is filled with cute and colorful cookie designs that are sure to make you smile. 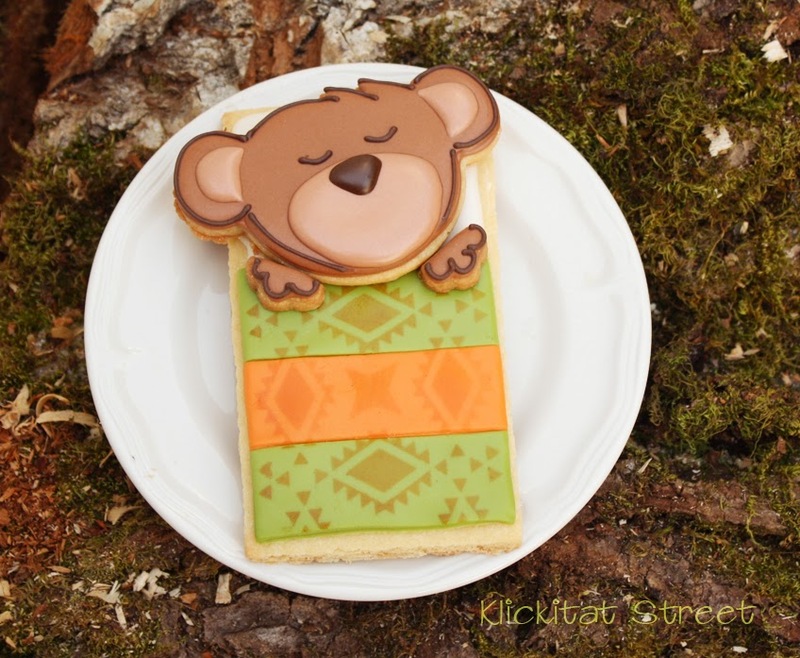 When I saw the design for Lisa's bear in a sleeping bag cookie I had to make one for myself. Seriously, I think this is the cutest cookie I have ever made! Lisa's book would be a great Christmas gift for any of your cookie loving friends. To win a copy right here just leave me a comment telling me your favorite cookie animal to decorate. Please make sure your comment is linked to your contact info or post your email so I can find you! 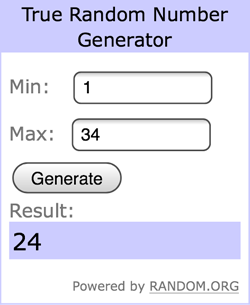 I'll leave the giveaway open until Friday, Nov 28th and pick the winner by random number. Comment #24...Linda, whose favorite animal cookies to decorate are bears! Boy, does Lisa at the Bearfoot Baker have you covered! Congrats Linda and thanks everyone for playing. 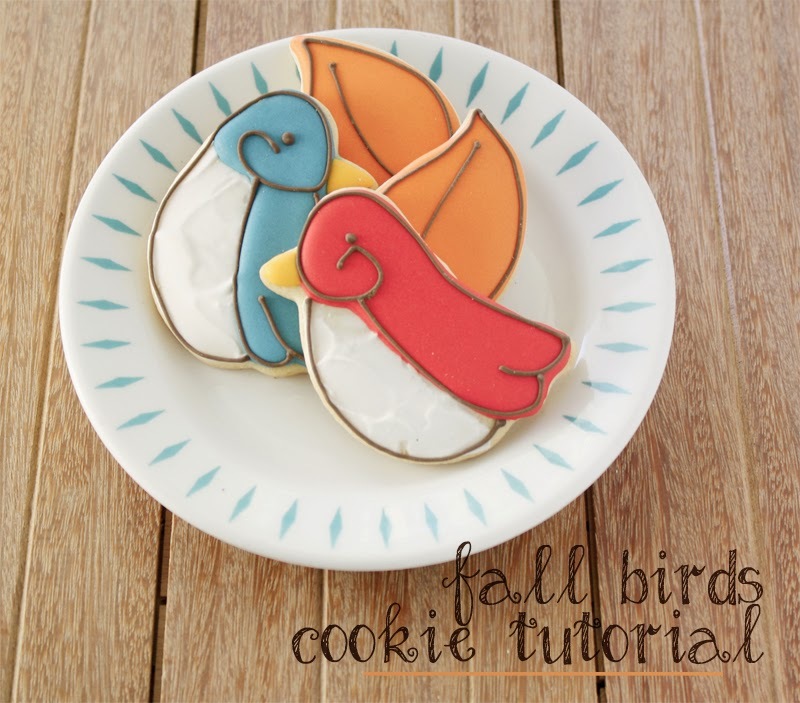 These days I am all about quick and easy cookies and I think these birds are just the thing. 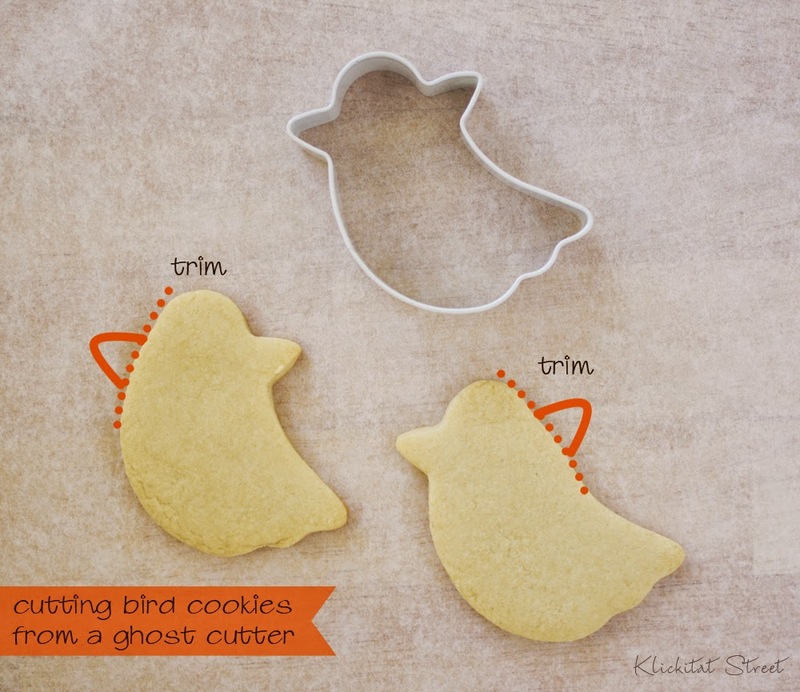 I may not get around to making Halloween cookies this year but I used a Halloween cookie cutter to make these little guys and that's kind of the same thing, right? I found this little ghost cutter with the Halloween things at Michael's Arts and Crafts a couple of weeks ago. As ghosts go I thought it was a bit strange but I quickly saw that it would make a great bird. Either those little points are supposed to be the ghosts hands or he is wearing a pirate hat. Regardless, trim one side off and you have a simple bird. I particularly like that you can make birds with turned heads from the same cutter! I started by using a small spatula to scrape on some thick white royal icing for the bird's belly. The thick icing will rather quickly and I think the texture adds some interest. After the belly has dried for a few minutes outline the bird's body in whatever color you like. 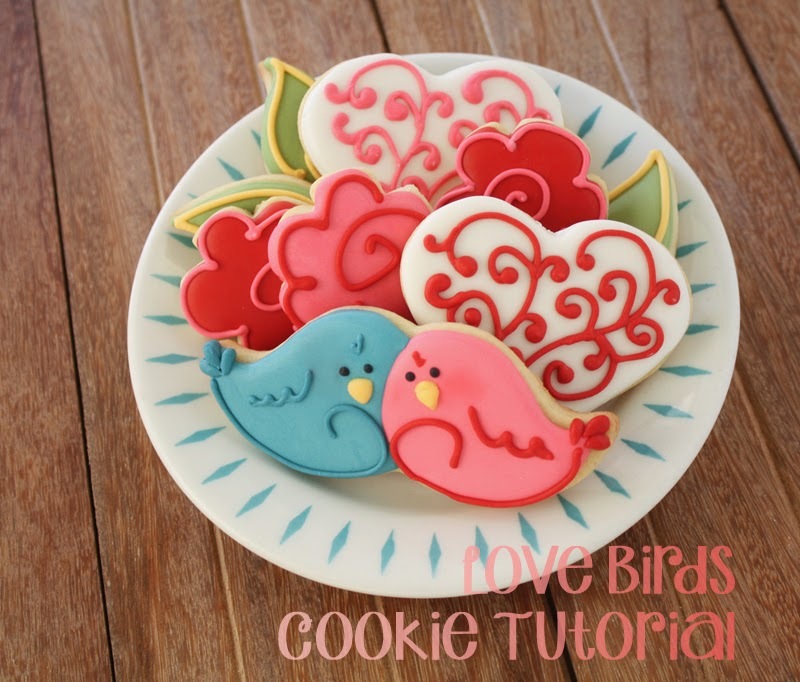 Allow the flood icing to dry for several hours before adding beaks and a few simple details. That's all there is to it. Throw in some simple leaves and flowers and you have a cute and easy fall platter! This post has been in the works for a long time. Like a "loooooooong time" as in months and months. Some family health issues have kept me away from my blog for a while but I'm so happy you've all stayed with me because today I'm announcing an addition to my Etsy shop; cookie stencils! Most designs are available as a 5.5" square upon request if you prefer to store your stencils all together in a 6" binder. I've started out with a few Halloween designs in my Etsy store today so stop by sometime and have a look. There will be lots more coming every week as well as tutorials and other fun things. 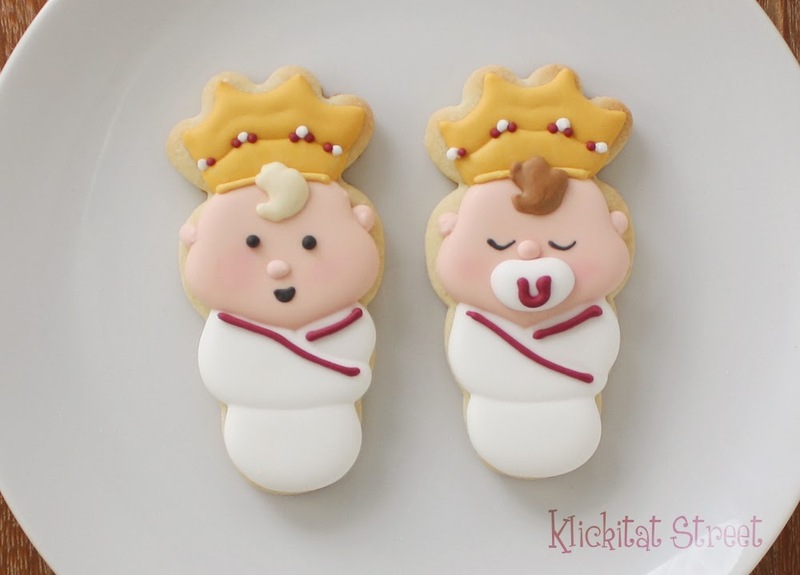 Today's post is especially fun because several cookie artists decided to have a virtual baby shower for two of my favorite cookiers and I get to be a part of it! Both Georganne from LilaLoa and Callye from SweetSugarBelle recently had baby girls on the same day if you can believe it. Since both of these fabulous cookie gurus are "cookie queens" their little girls are sure to be cookie princesses. I wanted to bring a little inspiration from both artists for this set and when I think of Georganne and Callye's cookie styles I think creative cutter re-purposing, bold color and a touch of silliness. 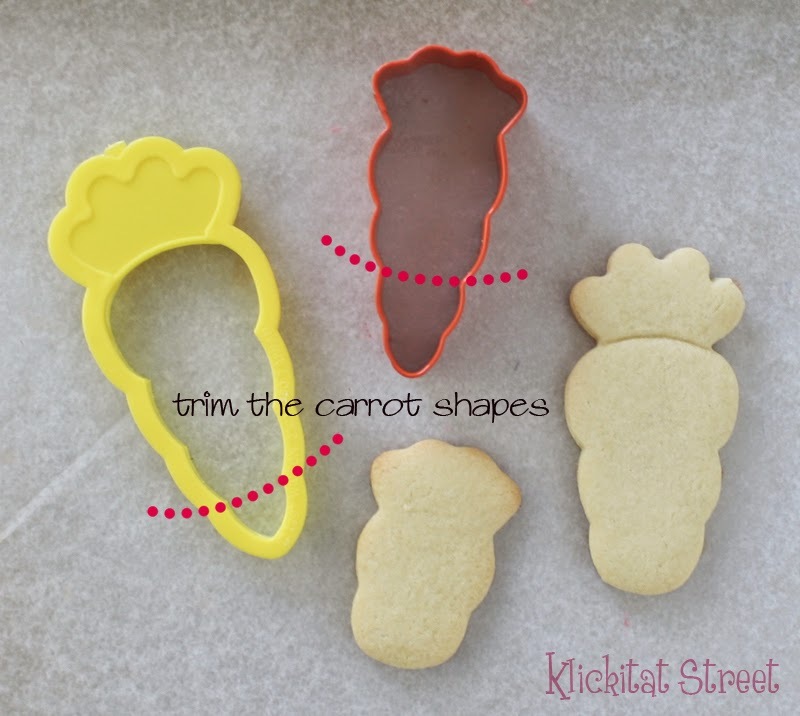 I used a basic carrot cookie cutter to make my baby Princess cookies. The carrot turned out to be the perfect shape for the crown and the swaddled baby and if you don't happen to have a carrot cutter this is just the right time of year to find one. My carrot cutters were both a little long so I simply trimmed the point off the carrot before baking. Start by filling the face shape in flesh-toned royal icing. If you feel you need a guide to get the head the right shape and size then make a paper template and trace the head onto your cookie first. Allow the face to dry for a little bit and then add the blanket in sections letting each section dry for a couple minutes before you add the next. 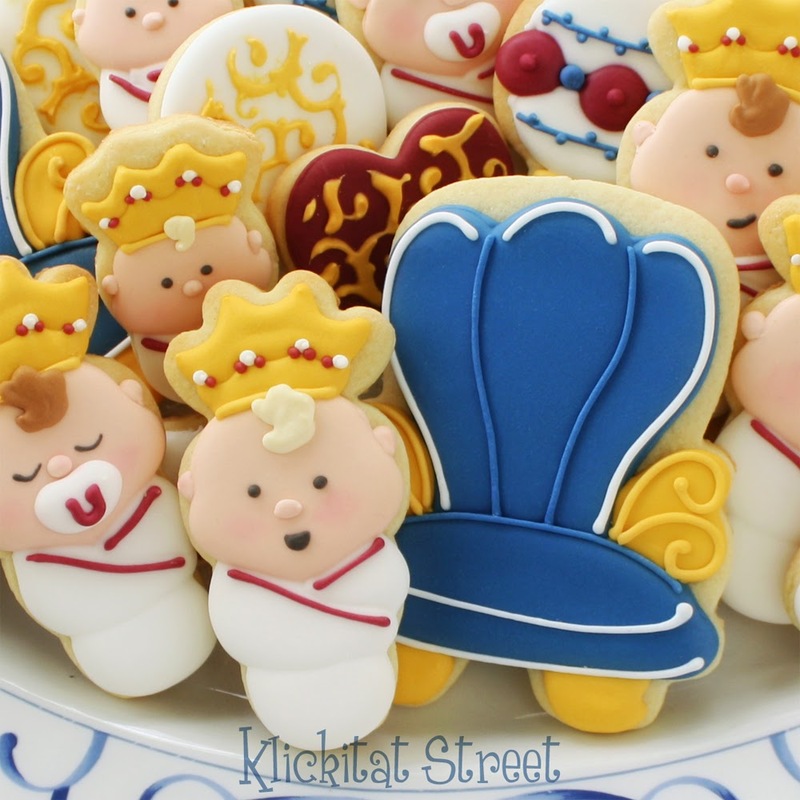 Add the crown in gold royal icing and let the cookies dry for several hours or overnight. Once the base has dried add a few piping details to bring the cookies to life. That's all there is to making the Princess cookies, not too difficult right? Of course every royal baby also needs a throne. Callye has designed some of her own cookie cutters and I used her bus cookie cutter to make the thrones. Then fill one section at a time allowing each one to dry for a few minutes before filling the next to create dimension between the "cushions". 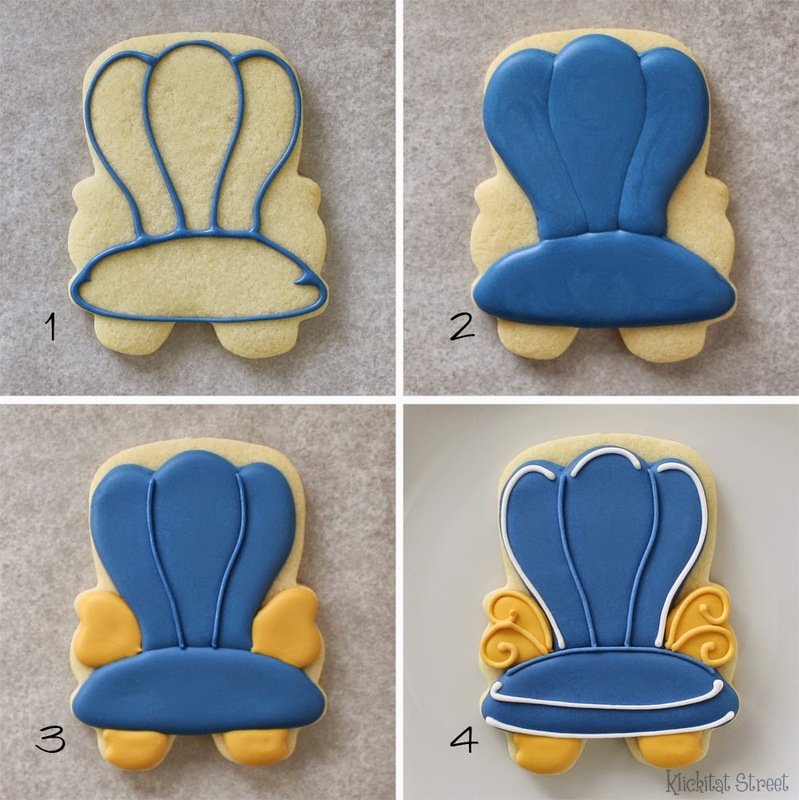 Allow the cushion sections to dry for a while and then add the arm rests and feet in gold royal icing. Let the cookies dry for several hours or overnight. Finish up the thrones with a few simple piping details. 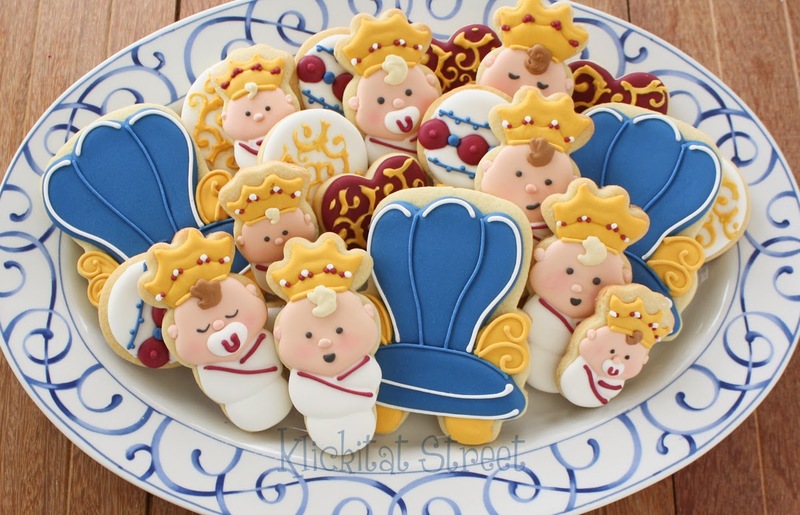 Be sure to check out all the royal cuteness these other fantastic cookie artist made for the virtual baby shower. They are so sweet I almost can't stand it! I'd like to give a big Congratulations to both Callye and Georganne on the births of their sweet little girls and thank everyone else for stopping by! 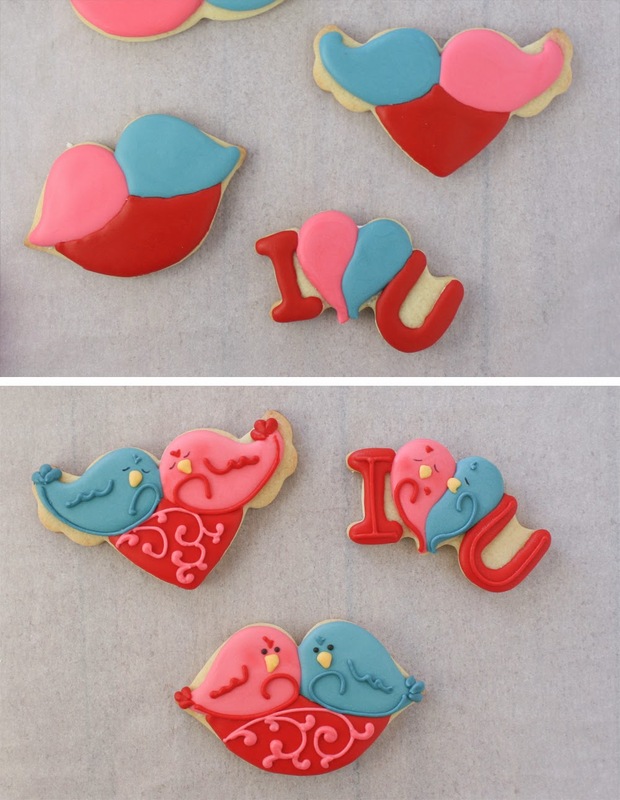 Valentine's Day is right around the corner but I think I'm still recovering from Christmas cookies! Thankfully these cute lovebirds were just the ticket to get me working again. 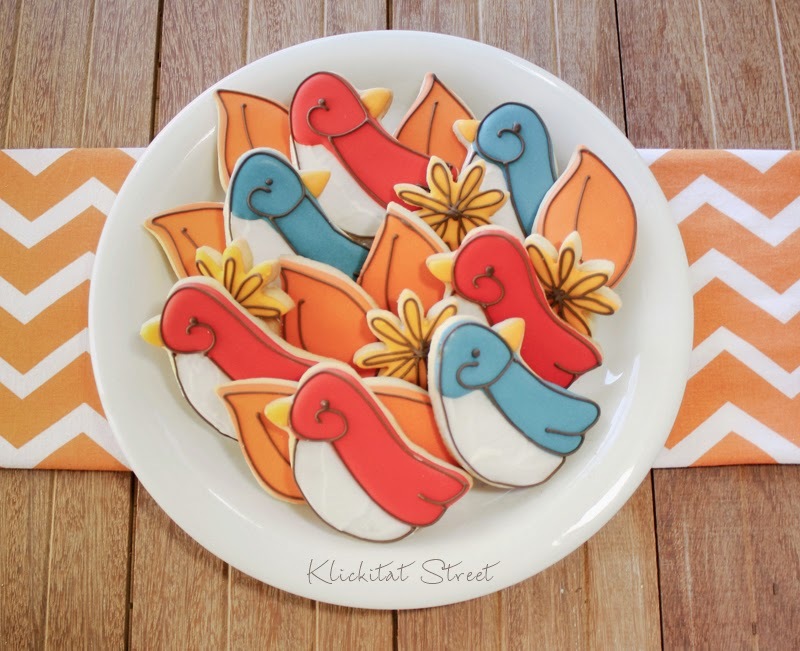 If you need a quick cookie pick me up these little guys are super easy and cut from a common cookie cutter too! 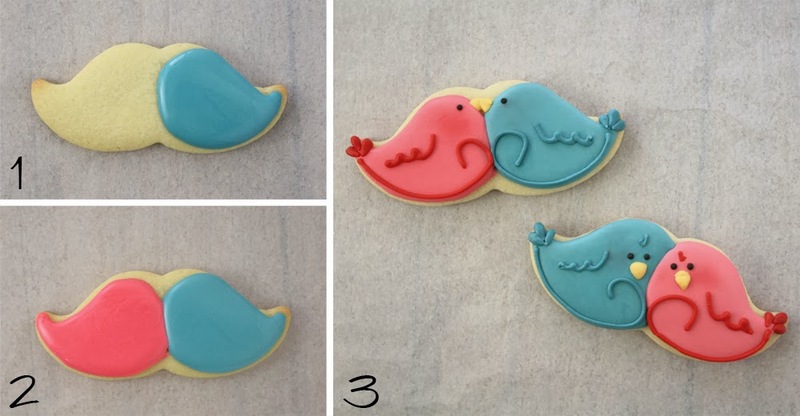 I used a basic mustache cutter to cut the love bird cookies. Specifically, I used the mustache cutter from this 3 pc cookie cutter set by Wilton but most any mustache cutter will work just fine. 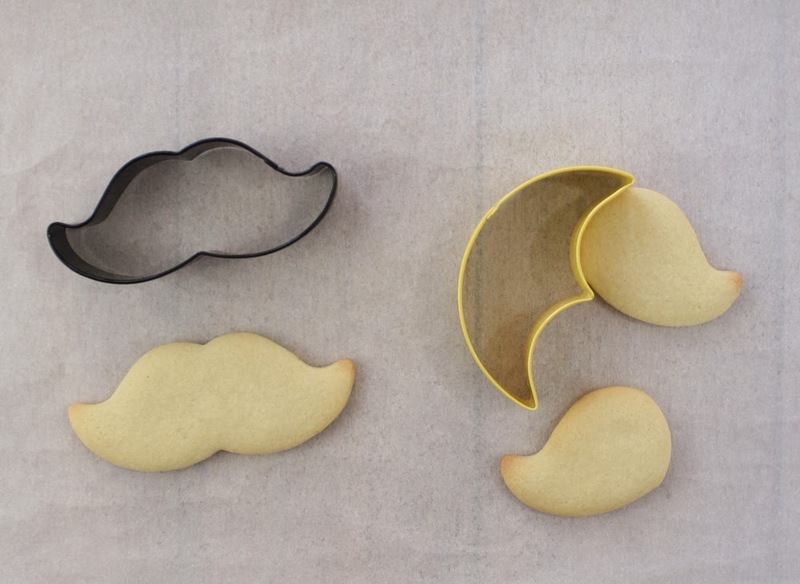 You can cut single birds with your mustache cutter as well by using a moon cutter or my half circle trick to trim the mustache shape before baking. 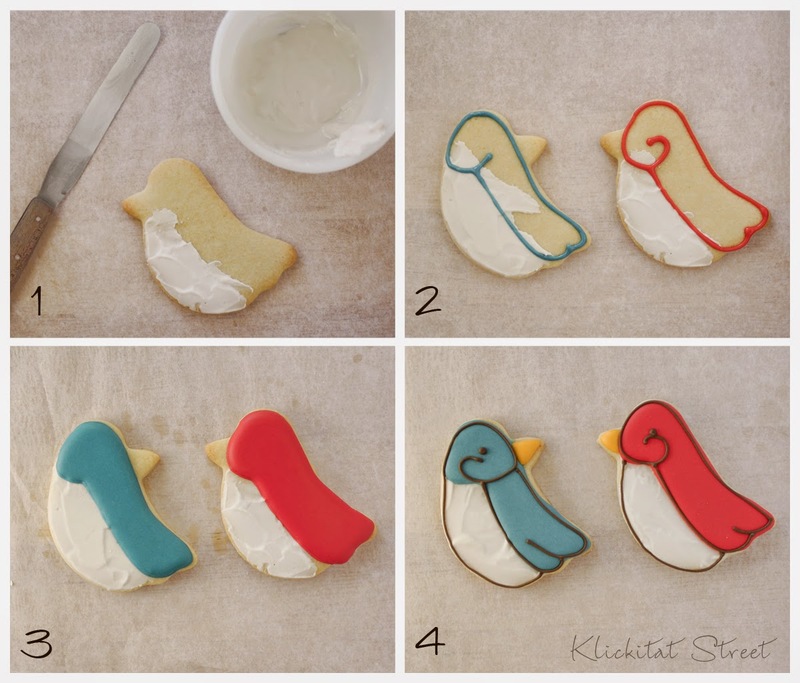 Start by outlining and filling one of the birds in royal icing and let dry for 30 minutes or so. Once the first bird has set up a bit, outline and fill the other bird. Let the birds dry for several hours before adding a few simple piping details. Most cookies come together in the detail step and as you can see these little guys are no exception. I used the lip cookie cutter from the same set as the mustache and a flying heart from this Valentine cookie cutter set to make bigger cookies with a little more flair. 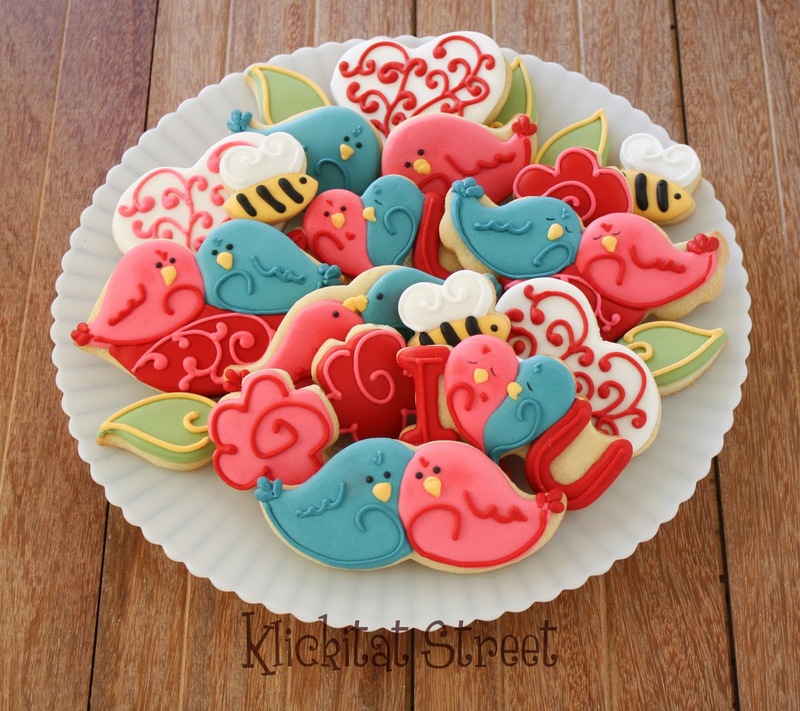 I think the I heart U birds may just be my favorite of the bunch, but unfortunately I don't know where to buy that cutter any longer. Toss in a few whimsical flowers and hearts to round out a super cute and happy Valentine platter! I hope you enjoy these little guys and thanks for stopping by!